Heritage Eagle Bend is an over 55 retirement community in Aurora. Aurora patio home and retirement communities are in short supply. But, Heritage Eagle Bend offers offers lots of amenities for the over 55 crowd who enjoy an active lifestyle. In addition to all the amenities South Aurora has to offer nearby, Heritage Eagle Bend offers a 18 holes of championship golf, a clubhouse, restaurant, activities and even Happy Hours for residents. Patio homes, cluster hoes and town-homes surround the semi-private Heritage Eagle Bend golf course. 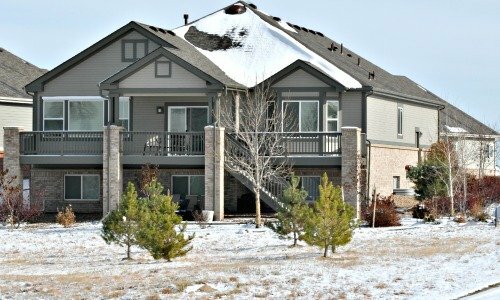 Heritage Eagle Bend is an active adult community situated in Southern Aurora, bordering Douglas County and with incredible Rocky Mountain views! This community is in my backyard and I watched it grow and now the surrounding areas have caught up. Golf is exciting and the community’s rolling hills can’t be beat. This gated, age 55+, master planned golf course community developed by US Home and Lennar Homes, boasts a world class par 72 golf course designed by Arthur Hills and a 35,000 sf clubhouse offering memberships and public golfing. Kick back and enjoy dinner or a drink at the Eagles Nest restaurant after a round of golf, or an evening without having to “hit the road” to another restaurant. Through the community or the golf club, there is never a shortage of things to do; golf leagues, poker, tennis, swimming, book clubs, car club, yoga, art classes, singles nights, weddings, banquets, and much, much more. 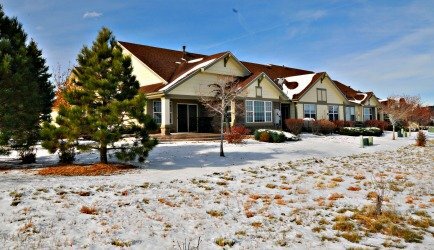 This Aurora home for sale is a large walk-out ranch with mountain views. The homes within Heritage Eagle Bend in Aurora, CO are all ranch style and vary from single family stand alone homes (some with walkout basements), to attached town-homes. All homes are low-maintenance so residents often do not have to worry about cutting the grass or snow removal. The homes are modern and many are significantly updated. They all built within the last 25 years. 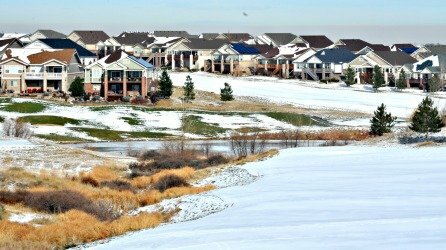 The golf course winds through the community therefore offering plenty of golf course views from the rear patios, while others have awesome views of Colorado’s Rocky Mountains. Open space is also abundant throughout the community and it’s often that you see wildlife. Home prices range from the $200’s-$600’s where you’ll find custom finishes and fire-pits, to maintenance free homes with few steps. Attached townhomes are also available in the gated Heritage Eagle Bend neighborhood. 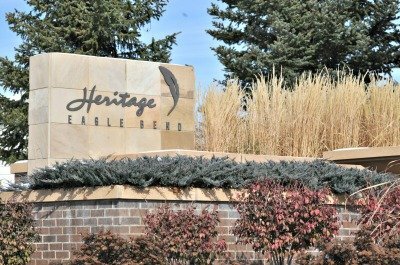 Heritage Eagle Bend is located off E-470 and Gartrell road. Amenities are minutes away; Park Meadows Mall, Southlands Mall, the town of Parker, Denver International Airport, and entertainment. Nearby you will find some great restaurants, strip malls with local services like dry cleaning and shops. Only one person in the household must be at least 55 years of age in order to qualify for residency. Golf course membership is not required but well worthwhile for those who play. We are interested in a rental with a 3 to 6 month lease approx. 7-1 thru 12-31 we are flexible, also 1200-1600 sf would be fine and would like to stay under $2,000/mo. Heritage would be great for us, but would go elsewhere in the area. We do have a small pet that is a support dog. Currently I am looking for a 2 1/2 plus bedroom, townhomes in the gated Heritage Eagle Bend neighborhood. I am age 60, I look and feel young like 40’s. I am looking to Rent long term 12 months or longer. I work in the Aurora Co area and would like to be in this beautiful community. I am budgeting at 900 to 1,400 a month.